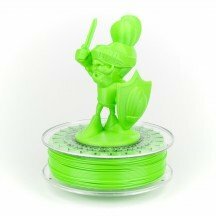 The XT ColorFabb filament is a resistant filament resulting from a unique formulation for 3D printing. The ColorFabb XT is odourless, contains no Styrene or BPA, is food-compatible and has a high glass transition temperature (heat resistance). The formulation of the XT makes it food-compatible (approval by the US FDA because of its PET-based formulation). The XT filaments of the brand ColorFabb are filaments with no Styrene or BPA, which allows them to come into contact with food, they have also been approved by the US FDA. Styrene is a molecule known to be carcinogenic and harmful to the human body, this molecule is present in polystyrene, for example. BPA is an endocrine disruptor, in other words it is a molecule that influences the production or function of the human body's hormones. The XT filament of ColorFabb is a very simple filament to print and is of good quality, this filament is ideal for producing pieces or objects intended to come into contact with food, like food containers and children's toys. The XT filament emits no odour during printing and has a high glass transition temperature which allows it to be used in more applications than conventional filaments like PLA or ABS. If you have questions or need clarification about the filaments in the XT ColorFabb range take a look at the product sheets where you will find all the information required for the printing of this filament, like its printing temperature, the plate temperature to be used, the recommended print speed as well as our customers' opinions of this filament. If you have any other questions, you can contact us via the contact section on our website, our experts will be happy to advise you in your purchases. The XT ColorFabb prints easily, think about consulting our buying guides and product specifications before buying the ColorFabb XT.